On this day, the Saturday before Palm Sunday, we celebrate the fourth-day raising from the dead of Lazarus, the righteous friend of Christ. Lazarus1 was a Hebrew, of the sect of the Pharisees and, as far as is known, he was the son of Simon the Pharisee, who dwelt in the village of Bethany. Jesus raised Lazarus (John 11:43). This strange wonder roused the Hebrew people to malice, and they were infuriated with Christ. But Jesus once more escaped. The high priests determined to kill Lazarus, because many who saw him were won over to Christ. Since Lazarus knew what they were thinking, he sailed away to Cyprus. He dwelt there and was later elevated by the Holy Apostles to be Archbishop of Citium (present-day Larnaka). He was beloved by God, conducting himself most nobly as an arch-presbyter, performing many miracles. Thirty years after his resurrection, in 63 A.D., he died once more and was buried in Citium2. It is said that after his return to life Lazarus ate only meals having some sweetness, because of the bitter taste in his mouth from having been dead. Also, it is related that the All-Holy Mother of God sewed his omophorion and cuffs with her own hands and presented them to him as a gift. Furthermore, it is told that Lazarus never laughed more than once after being raised from the dead, and that was when he saw someone stealing a clay vessel. At that point he smiled and said, "Clay stealing clay." Lazarus said nothing concerning those in Hades, either because he was not permitted to behold anything, or he was directed to be silent about what he had seen. The most wise emperor Leo, in 890 A.D., after a divine vision, transported the precious and holy relics of this saint to Constantinople to the church of St. Lazarus that he had constructed and deposited them reverently and ceremoniously to the right of the church's entrance against the front walls of the holy bema. Here his precious relics still remain, exuding an ineffable fragrance. The translation of his holy relics is commemorated on October 17. The resurrection of Lazarus is appointed to be celebrated on this present day, after the forty-day purifying Fast because our Holy and God-bearing Fathers, especially the Holy Apostles, found this miracle to be the beginning and cause of the fury of the Jews against Christ, when He was about to give Himself over to His Holy Sufferings. For this reason they set this extraordinary and wonderful feast on this day. 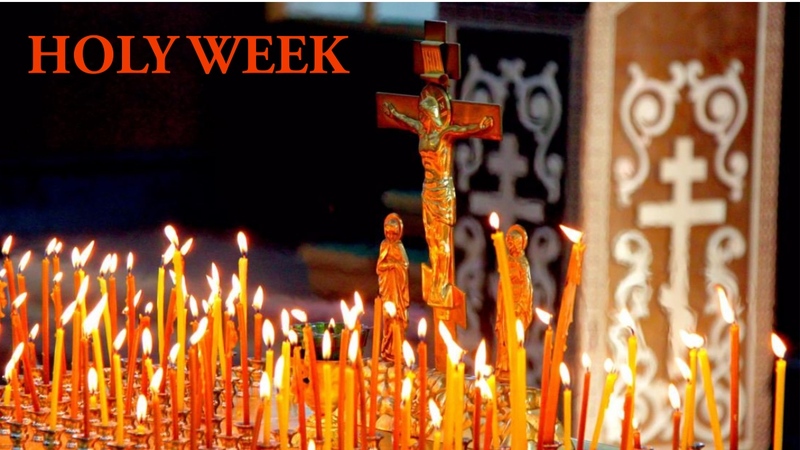 In addition, the placement of this feast by the Holy Fathers serves as a necessary "rest" and "transition" between the rigors of the Fast and the awesome and saving events of Holy Week. For in truth, yesterday evening's Vespers not only ended the Holy Forty Days, but also ushered us into a joyous prelude of resurrection. О Christ our God, have mercy on us and save us. Amen. 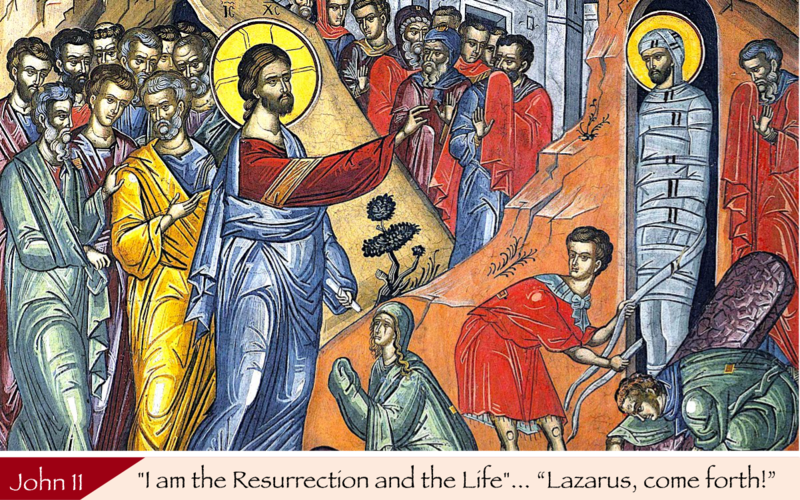 Lazarus is a Hellenized form of Eleazar, which means "God has helped." In the church of St. Lazarus in Larnaka, Cyprus, is his tomb, which was discovered in 1890 with the inscription, "Lazarus the four-days-dead and friend of Christ." Giving us before Thy Passion an assurance of the general resurrection, Thou hast raised Lazarus from the dead, O Christ our God. Therefore, like the children, we also carry tokens of victory, and cry to Thee, the Conqueror of Death: Hosanna in the highest; blessed is he that comes in the Name of the Lord. Christ, the joy of all, the truth, the light, the life, the resurrection of the world, in His love appeared to those on earth; and He became Himself the pattern of our resurrection, granting divine forgiveness unto all.